Isagenix Whey Thins - Get Your Protein Fix! Isagenix Whey Thins £ £14.00In stock! Order now! 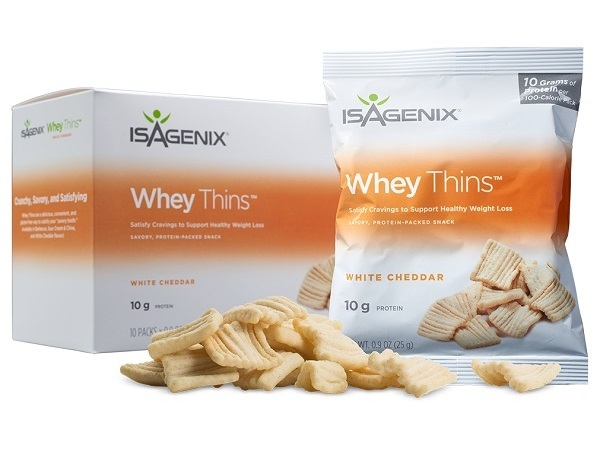 Whey Thins use the traditional Isagenix dairy-based protein formula to create the perfect on-the-go and low-calorie snacking option. Whey Thins are conveniently packaged into 100-calorie snack packets that include 10 grams of high-quality protein and zero trans fats. These White Cheddar flavoured bites taste great, and they are the perfect solution for snacking between meals without the consequences. Each box contains 10 packets. When striving for weight loss and building lean muscle, protein is an essential part of your diet. Not only does it help your body build and repair muscle tissue, but it also helps you feel satiated for much longer than carbohydrates or fats. This, in turn, will eliminate temptations and your desire to make poor choices by snacking on unhealthy foods throughout the day. Protein is the absolute ideal macronutrient to incorporate in your diet when you are trying to lose weight. Similar to the protein used in our meal-replacement shakes, the protein in Whey Thins helps keep you nourished throughout the day while simultaneously burning fat and building muscle. Isagenix snack products contain the Isagenix signature combination of macronutrients and vitamins to help you reach your weight-loss goals without ever feeling hungry. Whey Thins are an excellent choice for those looking for a convenient, guilt-free snacking option that will help with appetite control all day long. Whey Thins are kosher, have a low glycemic index, and are soy and gluten-free for those with food sensitivities. For more information or to purchase these delicious Whey Thin bites, click here. If you want to make the most out of every single workout and perform at your peak, purchase Isagenix Whey Thins directly from us. All products are shipped from the local distribution centre nearest to you, right to your door in no time at all. If you live in Europe, it’s time to join the Isagenix revolution and take your performance to a whole new level! How Much Are Isagenix Whey Thins? Each box (containing 10 packets) can be purchased for £19.00 at full retail prices, or sign up with us and pay just £14.00 per canister. Read Isagenix Whey Thins reviews from real Isagenix UK customers!